Over 84% of you voted in favour of the Parish Council obtaining a loan to help refurbish the Old School Community Centre, Charter Lane. The loan repayments will only commence when the Community Centre Trust have secured a successful funding bid. The Parish Council will then apply for the loan, matching 10% of the overall cost (max. £45,000). 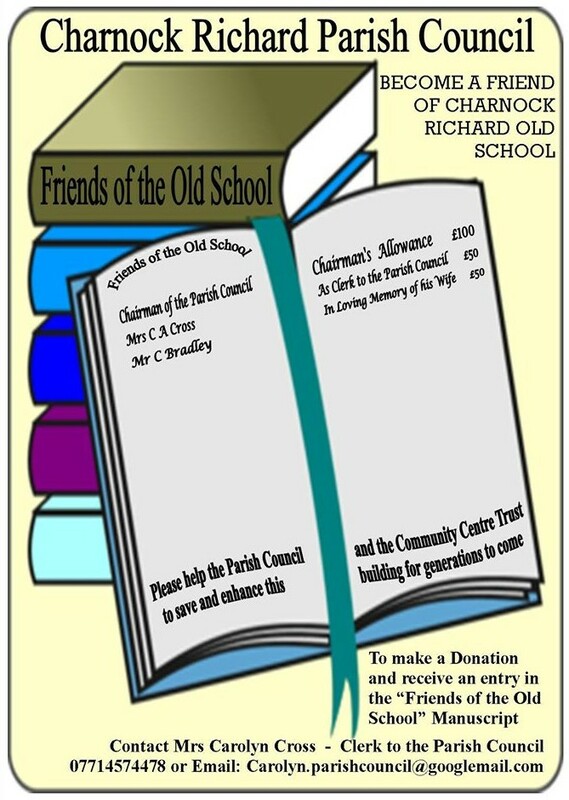 Help fund the refurbishment of Charnock Richard Old School by purchasing a brick for £10.00 or by donating £50.00 or more to receive an entry in the Friends of Charnock Richard Old School Manuscript. Email carolyn.parishcouncil@googlemail.com to make your donation or for further information. Please feel free to print off the flyers below for pinning to noticeboards or passing to anyone who is interested in making a donation. Charnock Richard Parish Council have been told that some residents were still not aware of the proposal to obtain a loan for the refurbishment of the Old School Community Centre on Charter Lane. This will mean a small increase in Council Tax for Charnock Richard residents however, the refurbishment will mean that the Old School will be back to it’s former glory & become an asset to Charnock Richard. Parish Councillors will be out delivering leaflets again to ensure all residents know about the proposals. The Old School and School House is a Grade 2 Listed Building. It is of architectural and historic significance as an example of a small village school built in mid-Victorian Lancashire by a local industrialist at a time of economic expansion and social development in Charnock Richard and surrounding areas. After building the Old School, James Darlington commissioned the construction of Christ Church about 200 yards along Church Lane and, after the death of his wife Frances in 1897, he financed the construction of the Frances Darlington Almshouses and Chapel which are situated next to the Old School. This trio of historic buildings, built in an “arts and crafts style”, is known as the Darlington Triangle. They collectively provide a fascinating insight into the impact of an entrepreneurial philanthropist upon the development of a village community located in the heart of the Lancashire coalfield. The Old School also has personal heritage significance for many in Charnock Richard and beyond who were educated there before its closure in 1975. Pre-Second World War pupils were educated at the Old School throughout their primary and secondary years and provide vivid reminiscences of those days. The School was also used for weekend social functions including dances and wedding receptions.